I was talking to my sister today. It’s her birthday! She told me that she had her kids and their wives over for dinner on Saturday as a celebration. Of course as a mom the celebration of her birthday meant that she did the cooking and clean-up. She told me that she had made chicken piccata and since she was making it for six people she dusted the chicken breasts with flour, sautéed them, and then set them aside while she made the sauce. Then she put the chicken breasts with sauce on top in a casserole dish and popped it in the oven for 15-20 minutes. So I thought what a good idea for Chicken Monday. After explaining to John what he needed to do we went ahead and prepared dinner. While the chicken was being prepared I made rice and broccoli. It turned out really well! But now we’ve ended up with more leftovers right before we are going home and I’ve already made soup!! 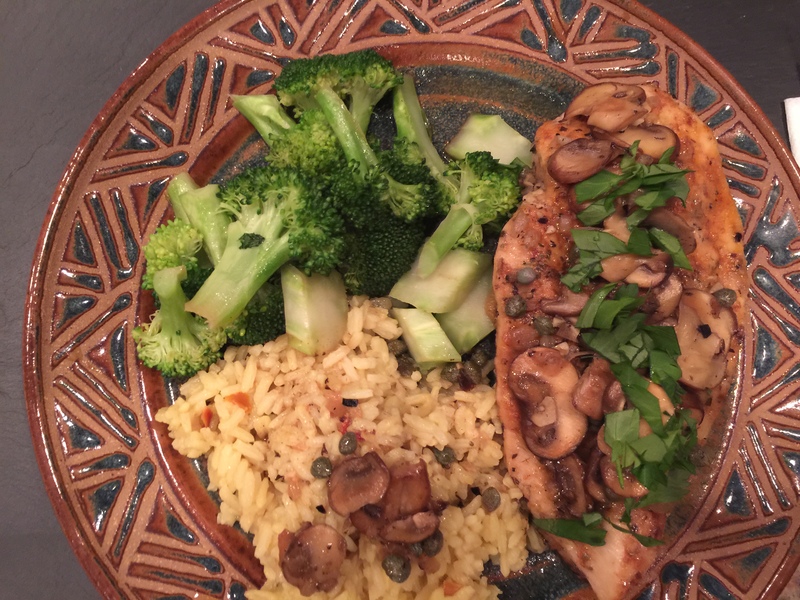 This entry was posted in Poultry, rice, Vegetables and tagged broccoli, chicken breast, chicken piccata, rice. Bookmark the permalink.